The Pound fell to 1.3088 printing a fresh weekly low, as ECB's dovish stance weighed on the UK currency during yesterday’s session. The pair propelled back up to 1.3151 during the day, on market talks suggesting the EU made a new offer to the UK on the Irish backstop. But the offer is said to have fallen short of UK's demands, bringing back pressure on the pair in a volatile session. Today, the UK Consumer Inflation Expectations will be released but the impact will likely be soft on the pair. However, the NFP report due later during the US session is expected to bring in volatility. 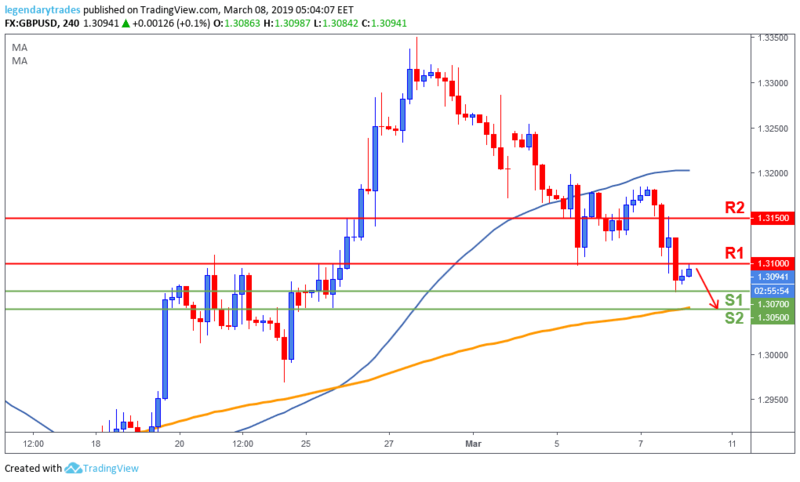 The Pound broke two previous supports in yesterday’s session until it found support at 1.3070 (S1). Since then, price reversed back towards 1.31 (previous support, new resistance). If this level holds, then we will likely see further weakness on this pair towards 1.3070 (S1) and potentially 1.3050 (S2), which is also the 200-day moving average (Yellow Line).